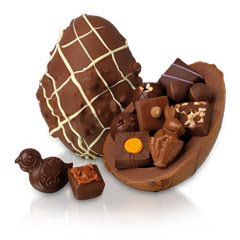 A big thank you to everyone who entered my Hotel Chocolat Competition. Unfortunately there can only be one winner. The prize draw has taken place over at Hotel Chocolat and I can now announce our winner. Nic from Nip it in the Bud. Congratulations Nic, your egg is winging it's way to you as we speak. I remember the chocolate Easter eggs when I was a child so well. These took me down memory lane. Congratulations to the winner!!!! Do you believe it, I don't have a single egg today Val? Jacqueline - if it make you feel a tad better, I don't have one either. Hope your having a good Easter weekend and that the weather is kind. woohoo, thanks Jac. Just returned from a wedding in the Isle of Man to find a 'sorry, you were out' card. Roll on Thursday when it's redelivered - yippee.